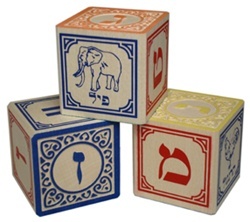 This set of 27 blocks provides 4 complete alphabets, 3 sets of numerals, and 27 different animal pictures. Made from Michigan basswood, brightly colored with child-safe inks, and handcrafted with attention to detail - including embossed letters and beveled edges. The blocks are a generous 1 ¾” (44mm) cubed a perfect size for small hands!